Around the world everyone is producing new ideas all the time that are pushing the world a step ahead in every direction. Licenses in this context help us all to know how can we use, re-use, modify, etc., the work that other people have been doing. In science, researchers often are using Creative Commons Licenses (CC), the Digital Peer Publishing License (DPPL), or the GNU Initiative’s (GNU-FDL) Free Documentation License, when they present their work to others. But what are these Licenses, what do they mean? 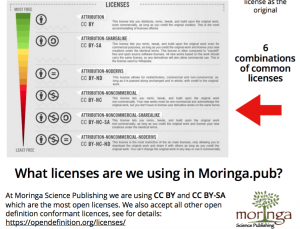 And what licenses are using in Moringa Science Publishing.